Fresh out of a highly competitive engineering school in Mumbai, 22-year-old Nitin Nohria aspired to pursue his interest in business, earn an MBA in America, then return home to become an entrepreneur. Neither happened. Instead, he applied to the Ph.D. program at MIT’s Sloan School of Management and was accepted. 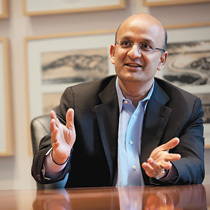 Once at MIT, Nohria realized that in management education he had found his true passion. After completing the program, he turned down offers from several business schools and joined the faculty at HBS, beginning a distinguished two-decade academic career that culminated in his appointment, beginning July 1, as the School’s tenth Dean at age 48. A specialist in organizational behavior and leadership, Nohria has coauthored or coedited sixteen books and written dozens of journal articles and case studies (see sidebar). I recently had a chance to talk with Nohria about his formative years, the opportunities he sees ahead for the School, and his views on the role of business in society. What follows is an edited version of that conversation. What was life like growing up in India? I grew up in three major cities. The first six years of my life were in Calcutta. Then we moved to Delhi, where I finished my schooling at St. Columba’s. Afterward I enrolled at IIT Indian Institute of Technology Bombay and earned a chemical engineering degree. As soon as I finished, I moved to Cambridge for a Ph.D. program at MIT. I feel very fortunate to have benefited from great educational institutions throughout my life. Perhaps the most important thing to share about my childhood is that my father was an extraordinary inspiration to me. In many ways, I think who I am today has been profoundly influenced by his example. He grew up in a very small village in India and was one of the first people in his family to attend college, where he studied engineering. He then went to England to get a diploma in management from Manchester Business School. Formal management education in India still was something quite new. He returned to India and ended up having a very successful career in business — first as the general manager and then as CEO of a small company, and later as the head of progressively larger companies. So my entire relationship with him was as someone who was a professional business leader. I traveled a lot with my father as he was starting manufacturing plants all over the country. Some years later we would go back and visit, and I saw the extraordinary impact that business could have on society. In places where there was nothing, factories got built, and jobs got created. Before you knew it, new factories were built close by to supply the first plant. Out of what was one plant, often in the middle of nowhere, seven or eight years later you’d see thriving communities. These plants produced products and services that were important for the development of the nation. Some of my most profound memories as a child are of those times with my father. I saw him as a businessperson doing the things that created the beginnings of the business infra-structure in India, which now has taken off dramatically. My great love for business, and my great belief that animates so much of what excites me about being Dean of Harvard Business School, comes from these early experiences that demonstrated the incredibly powerful role that business plays as a contributor to the prosperity of society. Why did you make the switch from chemical engineering to studying organizational behavior and leadership? Very early on I discovered I wasn’t going to be a great chemical engineer. My interests always drew me to think about business. In India, I spent every summer working in a variety of different companies. When the opportunity came after I finished my engineering degree, I applied to MIT’s Sloan School of Management. I started in international finance, which is what I thought I was going to do. But I discovered organizational behavior and leadership, and ultimately my interests went in that direction. MIT for me was a remarkable period for discovering and focusing on my intellectual passions, even though I think the roots of it go back to the relationship with my father. I didn’t put it all together until I came to MIT. When I graduated in 1988, I had offers from nearly all the business schools I had ever dreamed of being part of. In the end, the choice came down to Stanford or Harvard. I have to say, and this is not 20/20 hindsight remaking of the story, that I really did fall in love with Harvard Business School the first time I came here. It was a place that resonated with me because it was committed to the education of people like my father. It was a school about general management. It was a school that was associated with developing leaders who would go out and run large, complex enterprises or build new entrepreneurial ventures. It was about educating the kind of people whom I always had admired, people making a difference in the world. Of the many books that you have published on leadership and management, which one speaks most directly to the challenges you face as Dean? I’d say In Their Time because it highlights the importance of the broader context and how profoundly it shapes the evolution of business and leadership opportunities. I begin as Dean at a time when there are really important contextual changes taking place in the world. Let me highlight five such factors that we discuss in the book. One is the changing nature of the geopolitical economy. When I came to the United States until pretty much the present, I would say that we have been living in an America-centric world in terms of business education and the conduct of business. The most important management practices were being developed at American companies. That’s changing. Although America will continue to be enormously important and a dominant player in the global economy, we’re living in a world where other spheres of economic activity are also becoming important. Emerging markets are certainly a key piece of it. But the unified European market has also become more important. And it would be a mistake to neglect Japan. So management practice, which often informs the cutting edge of management thinking, is becoming more global. We’ll have to find a way as a school to make sure that what we teach reflects the innovation that’s occurring all around the world, as opposed to innovation in the United States alone. A second factor that we talk about is technology, which has always been a great force for change. I have a sense that there will continue to be important technological changes that we, as a school, will have to learn how to be on top of and respond to because the changes will influence the field of management. For example, there are amazing technological innovations taking place in the life sciences, in clean tech, and in computer science that could profoundly reshape the business landscape. A third factor is regulation. Whether or not you like the regulatory reform that’s occurring in America, the reality is that we’re going to go through a period in which there will be a lot more regulation. So we have to find a way to help the next generation of business leaders know how to deal with the new regulatory infrastructure that is being created. A fourth factor is demography. Throughout history, changes in demography have had profound implications for business. We stand at the cusp of very, very important changes in demography. For instance, more than half the people graduating from U.S. colleges today are women. In professions like law and medicine, half of the new entrants are women. Business schools lag behind — not just HBS but every business school. We’ve got to figure out a way to respond to that. If you think about higher education, the best colleges in the world once were all in America and in Europe. But now there are great colleges all over the world. So we have an increasing supply of international students of very high quality to think about. What does that do to the mix of students on our campus? What makes American universities great, and what makes American businesses great, relative to any other institutions in the world historically, has been a capacity to be true meritocracies. They are places where the best people can gather, can be inspired to do their best work, and can be celebrated for having done their best work. We need to create a world in which we can take advantage of these demographic changes. That’s a huge challenge for Harvard Business School and for the business world. Finally, the fifth factor involves the question of social mores. Through this last economic crisis we’ve come to at least pause and question the values that have animated business over the last two decades. I don’t know how that all will shake out. But I think society will demand that business be seen as more responsible to social interests, and we’ll have to respond to that in some way. This will be especially important because humanity faces some urgent problems. How, for instance, do we deal with sustainability and the anxiety that people have about the environment? How do we address issues of health care, which now consumes more and more of society’s resources, particularly as people live longer? Global poverty is a huge issue as the demand for a more prosperous life increases everywhere. And then there is global security. So there are some big global issues that will demand and attract the attention of business, which has always been part of the solution to global problems. That’s another great opportunity that these times present for us as a business school. Given that challenging context, how will you set your agenda for the School? I have been a student of leadership and organizational change, and in many ways I’m trying to follow what I have advised other people to do. No agenda can be executed unless it is collectively owned and shared by the people who have to deliver on it. I’ve already begun this process by setting up meetings with every faculty member individually to learn from them the priorities that they would set for the School. In addition, before appointing me, President Faust conducted a very exhaustive search during which she learned a lot from all kinds of constituencies. I have had the benefit of hearing her distillation of that input. I’m also talking with key staff, and I’m reaching out to our alumni around the world. I want to finish much of this by the end of the summer so that, hopefully, by early fall at least three or four priorities will emerge around which there will be a critical mass of interest to mobilize and act upon. That’s the process I’m currently undertaking. Of course I have my own ideas, too. What I really want to do is to make sure that we find those places where there’s triangulation, where a lot of constituencies collectively agree on the priorities we should pursue. We are very fortunate to have the luxury to take on big challenges. I see my agenda as ushering in a new century of innovation for Harvard Business School, on the order of the innovation that was accomplished over the School’s first century. We’re an amazing institution that has always been at the forefront of management education. I think we have to bring in a period of innovation in which we are willing to do some bold, brave things that will set the course, not just for our school but for the entire field of management education for the next 100 years. This is the moment to do it. And thanks to Dean Jay Light and my other predecessors, we are strong and well positioned. We have the resources. We have a faculty with the energy to go out and do bold things. And I feel blessed to have so much support from our students and our alumni to actually act on this opportunity. Public confidence in business has diminished significantly over the past couple of years. How can business earn it back? Trust in business is highest when business is seen as doing things that create value for society. You gain society’s confidence when you are seen as solving the biggest problems and contributing in ways that are innovative and imaginative. We need to return to creating real value for society. That’s the best way to earn back trust. In the meantime we also have to stand up and say we’re going to do things ethically, honorably, and responsibly. But the real way we’ll reclaim it is through our actions that produce value. If we can educate students who understand that and go out and do that — build companies that create real value for society — then trust will be restored. On a completely different note, what do you like to do for fun? I do two things. I love to cook. I’m vegetarian, and I cook Indian and Italian food. At home, I’m the chef. If I don’t cook, we eat cereal. And second, I have for a long time been a small collector of Indian contemporary art. I have always loved the arts. Things that have aesthetic quality are enormously important in my life. So much of India is known largely by Indian antiquity. There’s no real exposure to Indian contemporary art. That’s a pity because there is a very vibrant contemporary art scene in India, just as there is in every other part of the world, which serves as a powerful window into the constantly evolving nature of society. Dean Nohria has focused his research on human motivation, leadership, corporate transformation and accountability, and sustainable economic and human performance. A prolific writer, he has authored over fifty journal articles, book chapters, cases, notes, and working papers. “But what I love most is to write books,” says Nohria, who is coauthor or coeditor of sixteen works. Of all those books, his favorite remains his first, Beyond the Hype: Rediscovering the Essence of Management (Harvard Business Press, 1992), coauthored with HBS professor Robert Eccles, with James Berkley. “We tried to identify what is truly essential about management even as management always changes,” says Nohria. The book proposes a new way of thinking that emphasizes the judgment of the individual manager in determining what to do. “There are some deep, enduring ideas in that book that I’m very fond of,” he adds. As Nohria explains in our interview, the book that speaks most directly to his challenges as Dean is In Their Time: The Greatest Business Leaders of the Twentieth Century (Harvard Business Press, 2005), coauthored with HBS lecturer Anthony Mayo. In it, the authors describe how business leaders have harnessed “contextual intelligence” to understand the zeitgeist of their times and marshaled it to create successful organizations. Paths to Power: How Insiders and Outsiders Shaped American Business Leadership (Harvard Business Press, 2006), with Mayo and Laura Singleton (MBA ‘88), is a companion to In Their Time. Both are based on the Great American Business Leaders database created by Nohria and Mayo for the HBS Leadership Initiative. The authors take a historical look at how business leaders, both insiders and outsiders, rose to power and how the demographics of leadership have changed over the past century. Among his other works, the most recent is Handbook of Leadership Theory and Practice (Harvard Business Press, 2010), coedited with HBS professor Rakesh Khurana. Based on the HBS Centennial colloquium “Leadership: Advancing an Intellectual Discipline,” the book brings together faculty and practitioners to assess what is known about leadership and to point the way for future research. 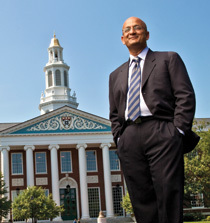 — To learn more about Dean Nohria, visit his Web page at www.hbs.edu/dean/. Is the Real Estate Market Going to Collapse?